Celery can be planted from its seeds which are used as spices. Best is to start cultivating indoors for a successful result and then transplanting to the garden during the end of cold climate. Late summer is the best time for direct sowing. Introduction and Uses: Celery is an excellent source of antioxidants and beneficial enzymes, along with Vitamin B6, K and C, potassium, and folate. Celery seeds help to lower inflammation and fight bacterial infections. 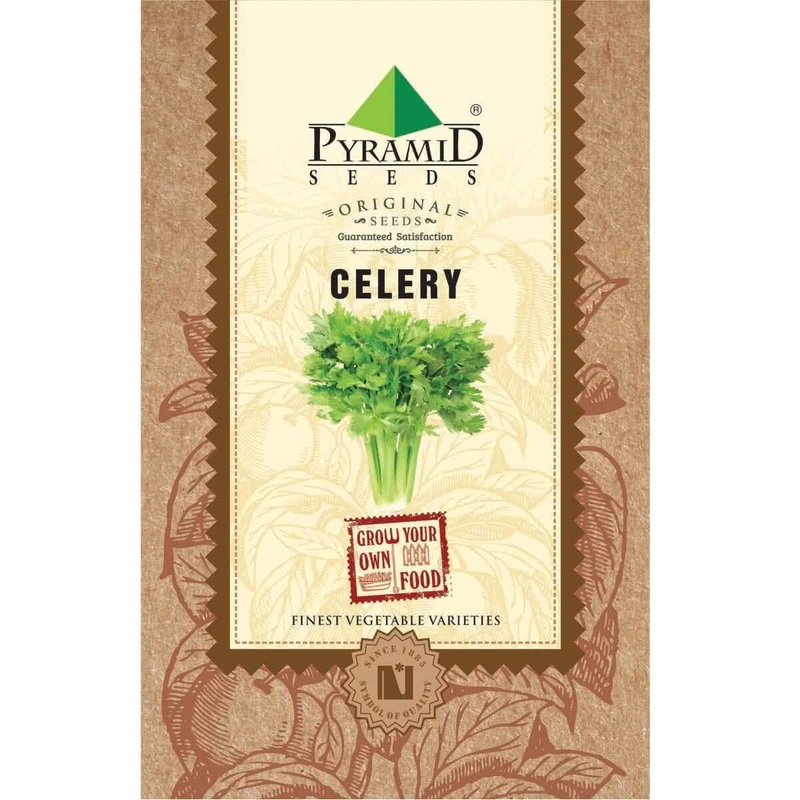 In certain parts of the world, celery is grown mainly for its beneficial seeds, which are a small type of fruit. These seeds are commonly used as a spice and contain an oily compound called apiol that is used to add flavour to authentic dishes and is also used in medicines. Because the seeds are small in size, Celery plant is grown by transplantation method. Seeds are first sown indoors in seedling trays or outdoors on seed beds & later the seedlings are transplanted into containers or in raised beds. Hold the Celery seeds on your left palm & sow 2-3 seeds per cell/cup. Since Celery seeds are small in size, they should not be sown very deep. Just put the seeds on the surface of the medium & push each seed a little inside the medium by using a pencil tip, so that seeds are not visible on the surface and then cover it with more coco-peat or make small, shallow depressions on the medium with the pencil bottom. Put the seeds on that depression & sprinkle more coco-peat on the top to cover the seed. Covering: Place the seed tray in a box or cover it with paper for first 4-5 days to encourage faster seed germination. Water the seed cells with a spoon in the first week. Provide two tablespoons of water every day or keep the seed tray in another tray full of water for half an hour, so that that water will get absorbed by the seed cells from the bottom, via drainage holes. If seed beds are made outdoors, protect them from heavy rain or direct sunlight. Use well sieved fine soil as a sowing medium & make a nice raised bed from it. Cover the bed by making a temporary roof of a plastic sheet. Water it in the form of a light shower by watering can. Sprouting stage:Seeds will germinate within first 6-8 days or so & tiny sprouts will be visible. Once seeds germinate, put the tray on an open partially sunny spot near the window. Don’t cover the tray anymore. Transplantation: 30 to 35 days after the seed sowing, your seedlings will be ready to transplant in container pots or on raised beds. 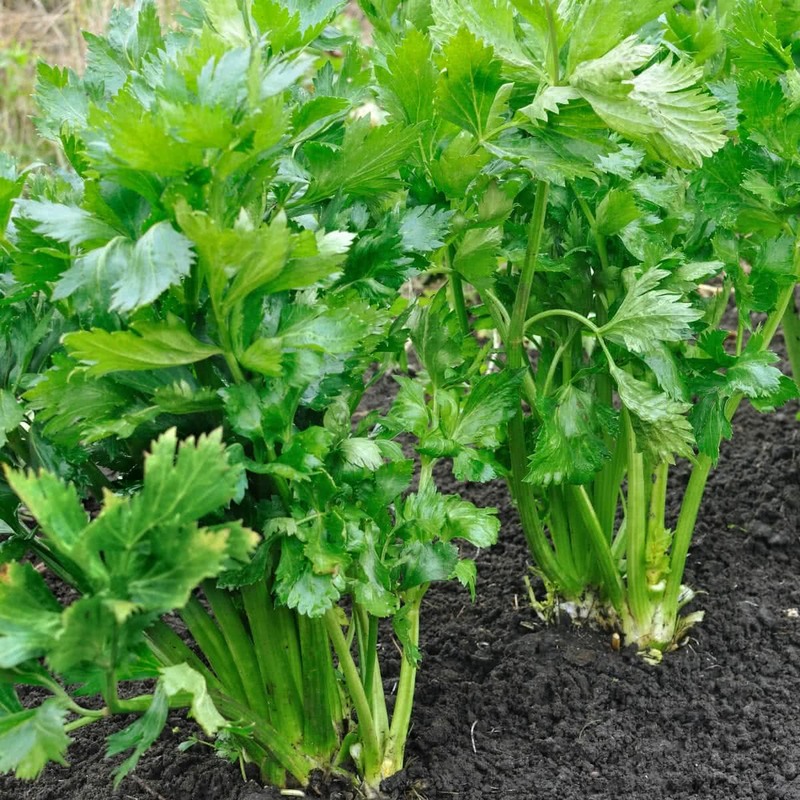 Ideal planting mixture for Celery: 2 part garden soil & 1 part organic manure, or 1 part garden soil, 1 part coco-peat & 1 part Vermicompost. Spacing:Plant the seedlings minimum 6 inches apart from each other in raised beds or a container. Sunlight: Celery grows well under full sunlight or partial sunlight in winter. So place your containers accordingly. Watering technique: Water your potted Celery plants every alternate day in winter. Water at the soil near the plant. Use a watering can, and make sure that the plants get water in the form of a shower & not by a single flow. You can also make provision for watering by watering by drip irrigation system for your raised beds. Avoid overwatering. Manuring: Add good quality organic manure in the soil with 2:1 ratio before transplanting the seedling. Organic fertiliser can be well rotten cow dung manure, farmyard manure, Compost or Vermicompost. Top Dressing: Apply balanced liquid fertilizers or handful of vermicompost to each plant, every 15 days after transplantation. Microgreens: If you plan to grow micro greens Celery grow it indoors in flat containers. Sow-scatter the seeds in a crowded manner. You can harvest it in 10-15 days by uprooting baby plants. Harvesting: (130-140 days from seed sowing). 90 to 110 days after transplantation, Celery will be ready to harvest. You can harvest it along with the stem, leaf stalks & leaves. The product met my expectation ,about 95% of the seed germinated. happy with my purchase.